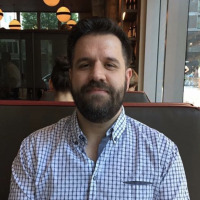 How many times have you sent an email and then realized a few seconds later that your snarky comment was sent to the entire mailing list, or left an embarrassing typo in an email to somebody you were trying to impress? 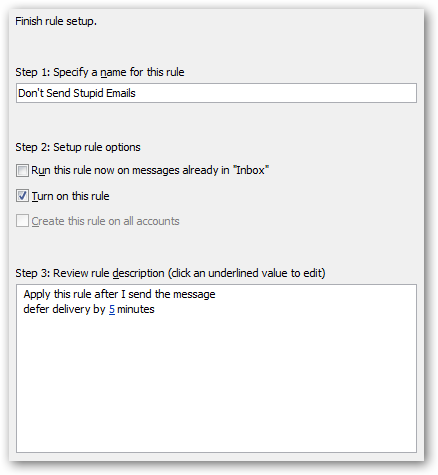 Using the “Defer” rule in outlook, we can setup a rule that essentially pauses all message delivery for a few minutes after you click the Send button, to give you a chance to recover. Select Rules and Alerts from the Tools menu, and then click on the New Rule button. 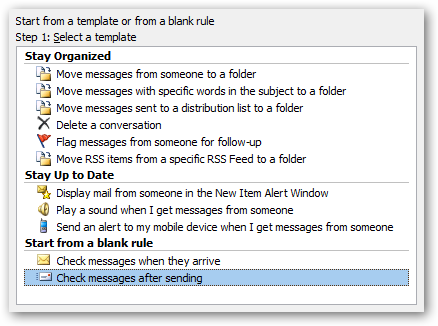 Under “Start from a blank rule”, choose Check messages after sending, and then click Next. Click the Next button again on the “Which conditions do you want to check” screen, and you’ll be prompted with this dialog informing you that the rule will apply to all messages. If you want to, you can set this rule up to only work for certain groups. 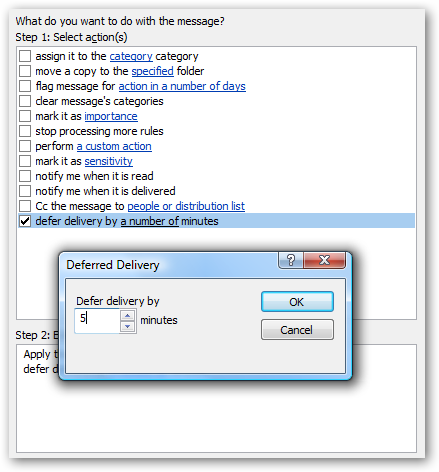 On the next screen, check the box for “defer delivery by a number of minutes”, and then click on “a number of” and change the defer minutes to something like 5 minutes, although you can change it to whatever you’d like. I originally tried using a 1 minute delay, but it didn’t give me enough time to realize the mistake and then locate the message and fix the problem. Click the Next button, and then give the rule a name, preferably something memorable so you’ll recognize it in the list. Now when you send messages, you’ll notice that they sit in the Outbox for a few minutes. If you want to stop a message from going out, your best bet is to just delete it from the Outbox, but you could attempt to just fix the mistake and then resend.